A place for my thoughts and what I have been doing. Hope to show more of my quilts. Here at the bottom of these blocks are the first of the Celtic Solstice. I have another picture of them if I can get it back. Here it is and of course still some of the leaders enders blocks. I need to take them off so I can put up the blocks as I get them together. I know I don't have all the pieces cut yet or made up/ I will cut and make them as needed. 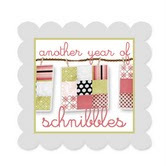 I know I have a lot that still need squaring and have been doing them as needed. I do like my colors and most are from my stash. I have bought several orange fat quarters. I am making the large one as all the kids now have queen or king size beds. Most of my older ones are really to small for them. Today while looking through the photos I came across a really cute one of Penny and don't think I have shown it before. Hope I can find it now. This Christmas my son came in for about 10 days and my daughter got a timeshare at Duck, NC on the upper part of the outer banks and we spent the week together. No kids, they all had something else to do like work. We did have our Christmas on Friday before when Angela and her boy friend came up and made dinner for us. So at least she got to see her Uncle for awhile. We had two really nice days on the beach although it was a little windy. Then two days of rain but I had taken some pieces to sew and some to cut so keep busy most of the time with visiting and seeing more of the outer banks than I had last year. The last week we have been in the deep freeze like the rest of the country and haven't gone out much. Even skipped my swim class on Tuesday when it was so bitter cold. It is now coming out of it ,thank goodness and hoping for some nice days but I know that winter is not over. Now that I see how blogger is working now I hope to get back with more pictures of my mystery quilt in progress. I know it has been a long time since the last time I wrote something on here . I have had a hard getting in here. Seems the button I have on my laptop hasn't worked and it was the key to getting in here. Finally this morning while fooling around and trying to get in I did. Now will save it to my favorites. I have finally finished my Easy Street completely. I had it machine quilted on a long arm. Just too many tiny pieces. It is now on my Hubbies bed. Since Bonnie is starting another mystery soon I want to be able to show the progress if I get a new camera or phone. That's what I want to get. Now will try to get a couple pictures from Picasa. I must continue this from the last post as this part was deleted some way. That is just blogger. As you see I finally figured out how to get pictures in and hope I will not forget. Will try not be more than a week before I post again so hope you will come back as I have more pictures to show you and some more to tell you . See you again soon and just one more picture. This is a finished wall hanging which I finished for my niece Roann that lives outside Colorado Springs on a Homestead that they are now building a home . Jim , her husband is doing most of it himself starting with the logs and making them into what needs to be made. They are coming along pretty good. She also has traded for three Llamas and wants to spin the wool. I want her to put this in her new rustic home. I have quilted it on the machine. ////////////////This is about it for now . Will be back soon. Finally I have gotten back here. Was able to get this pictures uploaded from Picasa so to catch you all up to my going ons. I love Bonnie Hunters mysteries this one is my favorite. I have the top ready to get it quilted and will probably get it machine quilted by the lady that does the Kids Quilt. She does a good job and then turns the money into the kids quit materials. She has done the one that I did from my husbands shirts and the last mystery I did Had asked my daughter how I should border it and she said to finish the chain on the border so I made more of the blocks and this is the finished product. I was looking through my drawers to see what I had and found these blocks dated 1997. I had won them at the Bowie Guild before I quit it. We used to make a block a month and those that made one had their name into the pot. One of the ladies that had signed has since passed away. She was older than I so really wanted to get these into a quilt. Love the way it turned out. It really needs to be hand quilted so might see about doing it next. 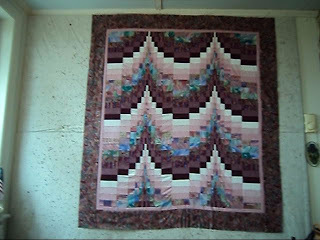 I am just finishing hand quilting the log cabin that I took to Colorado while visiting my son. Had to have something to do while he was at work. Love the way it is turned out and have had it signed up for the quilt show in June. Have just one side of the border to finsih and then the binding which I have made with scraps. A picture when it is finished. We are having a COLD spring. But at least have had enough warm to bring out the bulbs and he Dogwoods. Some of the little ones that we have protected after moving here are blooming. It's a good thing as the old one keeps loosing limbs during the winter and am afraid it is getting very old. Hope some of you at least come back to read this. Will try to keep this going now since I have found the right buttons to get the pictures in. The last blog was created at Picasa and then it left before I could get anything written. I know it has been a long time since I posted. Just haven't tried to get pictures uploaded so forgot about it. This afternoon I had a few pictures I wanted to show and found the way to do it and guess I didn't so it right. When I came into blogger I see that the one I started with the pictures had been published. So this is what the pictures are. The first picture is the compeleted top that I had brought from my nieces in Colorado. Someone had given it to her to finish and she doesn't have the time. So I brought it home to finish. The colors are really better than the picture shows. I had never made a bargello quilt so I wanted to finish it. Hard to tell when it will get quilted. The second picture is of my great-niece and her family from California. I was surprised with a short visit from them,. They are traveling the US mainly focusing on things for the kids. She home schools them. They are picking out beanie babies for each. 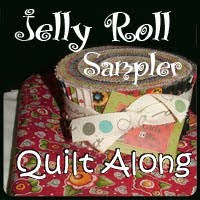 The next pictures show the quilt I am quilting now on the Juki. It is blocks swapped with my online Thimbleberries group and I can't remember the name of the block. Wanted mainly to show Kim. The closeup shows how I am quilting the blocks. When I finish them I will change to free motion the pattern I have marked on the alternate blocks. Can't work on this to long at a time as it is hard on the arms moving the quilt around. I have been doing alright. Busy the next couple weeks with two quilt retreats. This Thur, will fly out to Kansas City for a retreat with the TB group which has branched out into Civil War and Kansas Troubles. All simalar fabrics. But we have been going for well over 10 years. Then the following week is the Annapolis fall retreat at West River. This is mainly why I rejoned the Annapolis guild. They have one in the Spring and Fall. I missed the spring one while I was in Colorado visiting my son. I really haven't even been visiting my regular blogs. Haven't gotten a good list on this laptop. Just me not knowing how to do it or remember how. The problems of being old. Thanks for visiting and I hope to do better. Fall is really coming now. The leaves are falling and the dogwood trees are all red. That;s the best color we get. This is the last Schnibble that I did. When I got a snag in uploading the pictures into the blog I just gave up. That's why no blog for so long Sorry! ones from Fat Quarter Shop. I just got so fed up with trying to upload the pictures from Picasa. Well while fooling around in there last night while not connected to the Internet I found the link to do it. This is just a snip it of what I have finished of DHs quilt from his old plaid shirts. It.s a pattern from Bonnie Hunters and Quiltville. I took a class from her the first of the year. Now I am down to the last row of blocks to finish off 5 of the stars with 4 wide. Will have another picture later when I get it uploaded to Picasa. It seems the last two pictures I had uploaded didn't want to stay so will have to publish this and show them later. Just another Kids quilt and a pillow that a secret pal made me. Am not sure whether or not I have shown it. Since I wrote last, I took a long drive out to Ashland Ohio to see my other brother who is dealing with lung cancer. It was the first time driving this by my self. Have made the trip many times with my husband. Since Ashland was where we met. in 1947. Had 4 days to just sit and talk and remenance. Also spent a day with my sister's youngest daughter who left California many years ago to travel to Ashland to Collage. Like me and my brother she also found her mate and settled there. We had a great time. Now I am back into a routine of swimming 3 times a week and also going to our new gym in Boonsboro, that Nora Roberts built behind the Hotel. Called FitInBoonsboro. Am out on the circuit and walking the treadmill as many days of the week as I can. So am keeping busy. A good reason for not blogging much. Thanks for sticking with me.